Taking the plunge from recreational cyclist to racer can be a daunting step. Two years ago, holding a British Cycling provisional licence with no idea what I was doing, I was about to make that leap. It wasn’t graceful. Two years and two racing categories later I’ve come a long way, but every race is still a learning experience, and there is always someone stronger to rip your legs off. Here’s my racing story so far. It was the 5th December 2015. A grey day, damp with gusts of wind ripping across the Odd Down track. I was shivering on the start-line of my first race, partly from the cold, mostly from nerves and adrenaline. Looking back, its seems daft to have been so worked-up over a 3/4 cat criterium, but my mind span. Am I fit enough? What if I get dropped? How do I corner in the bunch? How fast is everyone else? I needn’t have worried; after 25 minutes of yo-yoing off the back of the pack, I dropped my chain with a terribly timed shift and was unceremoniously spat out the back. Probably a fairly common first race experience. But I was hooked. I knew I wanted to come back and be the one dishing out the pain at the front, and I was going to train until I could. I bought some books, most importantly Joe Friel’s Cyclist’s Training Bible. I’d recommend that any budding racer does the same. This book will teach you how to set ambitious yet realistic goals, identify strengths and weaknesses, then construct a focused, personalised plan to get you there. You’ll also learn a lot about key training principles, and how to think like a racer. Personally, I’ve found that goal setting is one of the most useful skills to have as an amateur athlete. Goal-setting and being self-critical is a skill in itself, and it’s probably the most important thing I’ve learnt so far. Given my somewhat obsessive personality, I often think, “What am I doing this month/week/day/training session/right now to achieve my goals?” I’ve found it provides focus and continuous motivation, particularly for those cold 6am winter rides when all you really want is another hour in bed. Next came a heart rate monitor, and a ramp test to find my training zones. Obviously I really wanted a power meter, but the student lifestyle has its limitations. Understanding how to train is one thing, but putting it into action is another. Like most novice racers, I didn’t get it right first time. In a way it doesn’t matter; during your first year of racing and training, huge improvements are possible just by getting out and smashing yourself to bits occasionally. It’s the honeymoon phase of training – enjoy it while it lasts. I made the jump from weekend warrior to consistently training 6 hours a week, with structured interval workouts and a plan to target the Castle Combe summer series. I was hoping to be competitive, maybe score a few points, but mostly just hang on to the bunch. Most of my training was geared towards the frenetic surging of criterium racing, with loads of VO2 max efforts and sprint intervals. I definitely neglected base and threshold work, but you can do a lot worse than smashing out hill reps while transitioning from recreational cyclist to racer. I’ll delve into my training in more detail in a future post. Hanging on at the Castle Combe Easter Classic 2016. Forgive the yellow bar tape, we all make mistakes. 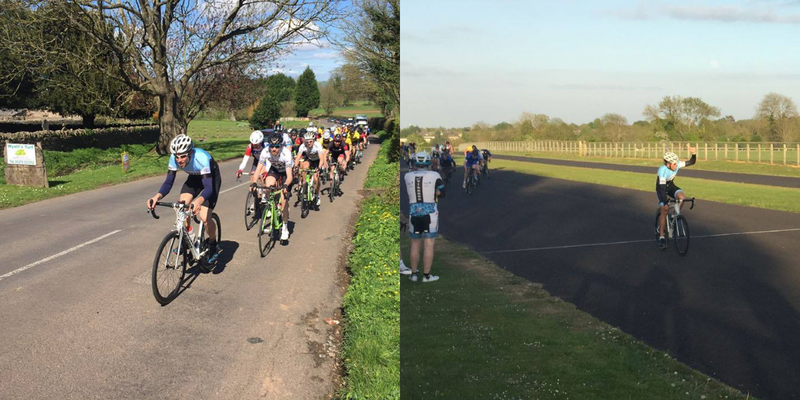 Four months later, I lined up for my second race, nerves jangling and pulse racing at Castle Combe for the notoriously sketchy Easter Classic. Predictably for an early season 3/4 race on a flat course with 80+ choppy riders, it was carnage. But I survived, and didn’t get dropped. Progress, and valuable experience of nudging elbows in the bunch. More training, more beginner-gains. At this stage it felt like every time I stepped on the bike I was quicker than the last. Come May, I felt prepped for the Castle Combe summer series. Combe is notoriously fast and flat – a sprinters’ paradise, particularly for 3/4 cat riders who can’t time trial away from a bunch at 50kmh. Fortunately, it turns out I can sprint. I had no idea this was the case, but in the first five rounds I picked up two wins, a 3rd and a 5th. That first win is scorched into my memory: rounding the final corner in about 10th wheel, biding my time and buzzing with adrenaline, then the absolute full-gas madness as the first person kicked. I latched onto their wheel, pulled past and put 10 metres on the chasing bunch. I actually couldn’t believe it – despite the winning margin, I had to ask the commissaires whether I’d got it. On the train home I rang just about everyone I knew: there are few feelings to top crossing the line first. The summer series was a massive learning experience. Each race, I was riding a bit smarter and getting to the end fresher. Castle Combe racing is rather one dimensional, so the tactics don’t really change. Stay hidden but near the front, and keep the powder dry until the last lap. Positioning is key: you may have to burn a few matches to be in the right spot with 500m to go. I’ve never won a sprint from more than 10 riders back when it all kicks off. As a novice, you can effectively “race yourself fit”, while picking up all the tricks of the trade. After picking up a podium in the last of 10 rounds, I’d wrapped up the overall series win too. My season goals had already been blown out of the water – I’d progressed up to 3rd cat and wasn’t far off the 40 points needed for 2nd. However, I knew I definitely didn’t have the engine to compete as a 2nd cat. Much more training was needed, particularly focusing on Functional Threshold Power (FTP) and endurance training. In my enthusiasm to smash intervals all week, I’d completely neglected this aspect of training. Without pause, I launched straight into more training than before. As cycling gradually became more of a priority, I managed to fit in more hours on the bike, and learn how to structure a training routine around work and the other bits of life. Unfortunately, I ran headlong into overtraining. It’s easy to fall into the trap of not taking sufficient rest when it feels like you’re making great progress. Now I know not to ignore the warning signs: poor sleep, lingering fatigue, continuous colds. After about a month of this, my immune system completely gave up and I got a huge dose of tonsillitis that managed to put me in hospital for two days. There is an important lesson here: train carefully, and when warning signs appear, back off. In the end, you’ll have to take more time off the bike through illness and potentially sacrifice a whole season. Lesson learned. After a few weeks off the bike, I went back to the drawing board to figure out how to be a competitive 2nd cat rider. A few late season 2/3 crits at Odd Down indicated I had plenty of work to do to handle the sizable step up in ability. The overall pace of 2nd cat races might not be that much higher, but the frequency and ferocity of attacks makes for much harder racing. Two points short of 2nd cat in September, I decided to stop racing and stay down for the year. I reckon this was a good move, as I could carry on being competitive in the coming season rather than getting trashed in every race. Up until now I’d not been part of a club, racing without the support or responsibility that comes with teammates. I decided to join a club, and I would recommend that anyone who wants to race does the same. I picked Bristol Road Club, partly because the Saturday club rides allow you a few lazy Sunday hangovers, and partly because the light blue kit complements a white bike rather well. Aesthetics are everything after all. It also turns out that they are a fantastic club, great for club run and coffee chatter, and a glut of racing talent to learn from. I just wish I’d joined them earlier, but I was concentrating too hard on cocking up a PhD. Over winter, I figured out how far I could push myself in terms of training load and set about executing a training plan, this time featuring way more base miles and longer sweetspot intervals. I also got stuck into some serious strength work in the gym, which I’ll detail in a later post. Almost all riders could benefit by being less scared of the weight room! The plan for the year: get my 2nd cat licence, pick up some points in the Odd Down summer series, and make the step up to proper road races in the local Cotswold League. Come March 2016, I lined up in the cold again at Odd Down for the last few round of the winter series. This time, racing against the 2/3s, the nerves of the previous year were gone. I picked up 9th, followed by a 2nd the week after, winning the bunch sprint. I was stoked to be competitive at this level: it felt like proper racing. Unlike Combe, aggressive riding and following the right moves are essential. 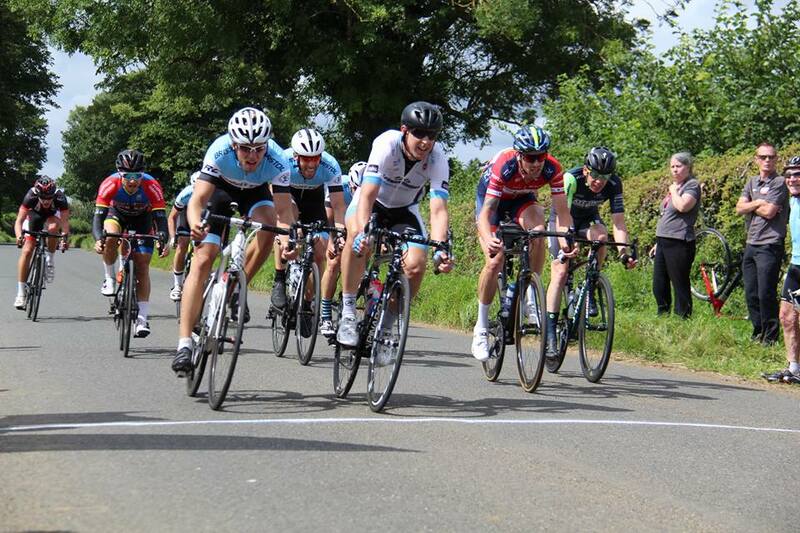 On the left, pretending to be Kwiatkowski lining out the peloton up an Alp – except it’s a 3/4 race up Stowey Hill. On the right, winning at Odd Down to make the jump to 2nd cat. That brings us to the start of the 2017 season, and the Bristol South road race. My first race outside the confines of a criterium. Eight laps of the punishing Stowey Hill circuit, I was expecting to struggle against the pure climbers. But, as it turns out, there are no 3rd cat “pure climbers” – it’s not the Tour. I picked up 5th in a grippy uphill sprint. A few days later, I comfortably won a 3/4 race at Odd Down and got my 2nd cat licence. The training was paying off. Another lesson: don’t pigeonhole yourself into a category of rider at this level. Get stuck into all aspects of racing and you may surprise yourself. In the last few months, I’ve been racing almost continuously. A torrent of weekday crits and club TTs, and Sunday road races. Who needs to peak when you can be consistently average, right? Aside from a crash and DNF at the Stella Farrell Exmoor GP, it’s been a great season and far beyond my expectations. Two podiums in 2/3 crits, and knocking nearly 3 minutes off my old 10 mile PB with a 21:51. After five Cotswold League races, I’ve scored points in every one and grabbed 3rd in the Bath CC road race – my first result from a breakaway. Of my results so far, this is the one I’m most proud of. Riding in a break is brutal. Constantly on the limit for nearly two hours, almost wishing to get caught to end the pain. The tactical battle with breakaway companions, allies one moment, enemies the next. The post race car-park camaraderie, united by the same hours of suffering. This is what proper racing feels like! Third in the Bath CC road race after clinging on for dear life in the break. As a team, we’ve also ridden superbly. We’re leading the Southern regional standings and have factored in just about every race we’ve entered. Team BRC blue has been a common sight on podiums this year. The season is drawing to a close and, burnt out from nearly 6 months of hard graft, I’ve enjoyed almost every minute of it. Racing may not be for everyone, but for riders with a certain mindset it can be incredibly rewarding. Far from sucking the fun out of cycling and turning training into a chore, ticking off milestones and personal goals can keep you motivated and hungry for more. The goal posts are constantly shifting, and there is always a stronger rider ready to drop you with ease. You don’t stop learning from training and racing, at least I haven’t in my limited experience so far. Training is an art and a personal journey. There is no one-stop solution for all: you’ll have to find your limits and gradually perfect what works for you over time. I know I definitely have a long way to go, but every time I pin a number on in a chilly village hall car park, or scrap for points in a Tuesday evening sprint, the cycling itch gets stronger. I’d encourage everyone to give it a try. Join a club, pin on a number, get it horribly wrong, and come back stronger.